The return of white, middle-class families to big-city public schools seemed like a pipe dream for many decades. In Boston, it has been a slow, steady march for a number of years. In other cities, including Washington, D.C., New York, and Chicago, it has more recently picked up steam. For families and educators who have been in these schools all along, it sometimes feels more like a steamroller. A school that for decades was made up of lower-income black and Latino students can shift within a few years to a majority of white, middle-class students. The new parents get involved in ways that the school hasn’t seen in a number of years, welcomed by many as a breath of fresh air. Following a generation of white flight, a new set of realities has come into play. White, middle-class young adults who grew up in the suburbs are increasingly seeing the value of city living, and settling into urban neighborhoods. Sometimes this is with the active support and encouragement of community developers seeking to stabilize and improve lower-income neighborhoods. And though many do so while opting out of the public school system, many do send their kids to public school. For some, this is a choice: they want to send their children to schools that have a diversity that they wished they had experienced growing up, for example. For others, it is not: once settled in to their new urban homes and starting families, some of these new residents have faced job insecurities and unanticipated declines in home values that eliminated the options of moving or paying for private schooling. In Boston, a handful of public schools across the city have for a decade served families who in previous eras would have bailed to the suburbs as soon as their children reached school age. The commitment of these families has spawned reenergized parent organizations, created new school-community partnerships, and raised tens of thousands of dollars annually. This trend is the envy of many big cities across the country. Yet there is a downside that must be addressed to ensure that all families benefit from such a resurgence. Last summer, I interviewed parents and staff at several Boston public schools that had undergone this revival. The head of a local community development corporation had charged me with documenting what these families do, so that she might support the families living in her organization’s subsidized housing to employ similar strategies to get a successful public education for their children. For, even with this mini-resurgence, big city public schools are uneven at best. They require care and feeding, vigilance and advocacy to ensure quality education. The racial achievement gap remains obdurate across the United States. The results of this research provide a sobering warning. Not all families approach their children’s schooling with the belief that they have options. I found that those who do go to great lengths to decide whether to send their children to public schools. Ad hoc research groups form among friends as soon as they have babies. Their members visit schools, create spreadsheets, vet references. Families who decide to go with the public school then enroll their children together, resulting in a support group to navigate the complexities once they are in the door. Frequently, they are not shy about taking their demands to the school principal before their children ever set foot in the school. Every family could benefit from such a support group and such advocacy. Yet families tend to stay within the networks of people they already knew upon entry to the school. My research brought me to a meeting of lower-income Boston parents of color to share my findings. Some had opted for charter schools, others for Catholic schools or Metco, Boston’s voluntary city-to-suburb school racial integration program. Some families present had not chosen to or not been able to deploy the kind of advocacy that white, middle-class families had. This did not just come from lack of time or know-how, but also from distrust and discomfort with the system. Though this difference in engagement is too often blamed on the perceived deficits of the low-income families and families of color, it stems just as often from the shortcomings in the way our institutions have treated them compared to white, middle-class families. Often, these parents, or others in their networks, have not been treated with the respect and deference afforded to white, middle-class families. I have heard endless stories from parents of color who are brushed aside by school secretaries, told by teachers that their sons have ADHD and need to be put on drugs, and had their children kept back when their academic performance warranted being pushed ahead. In addition, for many blacks and Latinos raised in Boston, childhood memories still sting of school bus rides across town that were met with racial violence during the volatile era of court-ordered desegregation in the mid-1970s. As a white parent, I never experienced any of these things. And I might not have taken such stories as seriously if I hadn’t heard them repeatedly, across the city and across the country. Research studies bear out these patterns. So what does this have to do with the returning middle-class families? Of course, we want to encourage middle-class families to invest in urban neighborhoods and the public schools that come with them. Their activism typically contributes to expanded school offerings, new equipment, upgraded playgrounds—resources that all schools deserve. Their demands can bring needed attention and accountability to school problems. For community developers, such investments further stabilize the neighborhood. The question we need to ask is: At what cost, and for whom? This is an example of one way that the return of the middle class can be problematic. Test scores go up, and the appearance of success takes the pressure off of the school to address the underlying barriers for low-income students and students of color. These barriers often include a curriculum that does not connect to the reality of such students, a school culture that denigrates their home culture (whether consciously or unconsciously), discipline that disproportionately singles them out, and a general attitude that their families are not assets but liabilities to be kept at arm’s length. The white, middle-class families “fit in” more readily to a system that values their culture, and problematizes others. New families use their professional skills and political clout to bring in resources and hold schools accountable. Organizers working with public schools in Boston and Washington, D.C., describe eerily similar dynamics, where the activism of the new parents has undermined existing systems that supported the lower-income families. 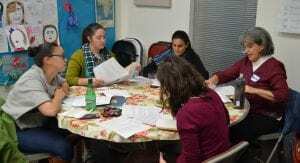 A monthly morning coffee and discussion group that attracted Spanish-speaking parents is suddenly supplanted by a highly organized, more traditional parent organization. Less formal structures that have provided lower-income parents of color with a voice and support network find themselves marginalized by the better organized groups. They no longer get the attention of school leadership and don’t feel welcomed by the new organizations due to a vast cultural gap that neither side fully understands. While schools begin to look better integrated from the outside, it is frighteningly common that the white, middle-class students are on a very different track within the school than the lower-income students of color. Gifted and talented classrooms and special education classrooms within the school are isolated from each other. Across the United States, these groupings have starkly different racial and socioeconomic makeup, and provide very different educational opportunities and trajectories. These challenges can be addressed, but first must be named. In Boston, the YWCA facilitates dialogues in schools across the city, providing a safe space for holding such conversations and building relationships across difference. In Washington, D.C., Teaching for Change, a community organizing group, is bringing together the leadership of an informal low-income parent group and the formal middle-class parent organization to identify and address these tensions. Work with schools to reach out to families who are not actively participating, using the well-honed strategies of asset-based community development to identify their interests, barriers to participation, and the social assets they bring to their children’s education. Work with the families who have been marginalized, to strengthen their advocacy skills, open doors to those in power you have relationships with, and support their organizing for the things they need to ensure schools are meeting their demands. Work with the active parents to plan activities that intentionally build bridges across race, language, and socioeconomic differences. Work with city leadership to monitor resources and student achievement, school by school, and to identify ways to help under-resourced schools bring in additional, targeted resources. Work with advocates for increased resources and accountability within the public schools. In the final analysis, families shouldn’t have to compete for scarce resources and a quality public education. There should be enough of both to meet everybody’s needs. There are organizations in many cities that work systemically to improve and hold accountable their local public schools. By partnering with such groups, community developers can nurture improvements that benefit all, and don’t leave anyone behind. Susan Naimark worked in community development for many years, most recently as the director of National Community Building and Organizing Programs for NeighborWorks America. She served eight years on the school board for the City of Boston, and was one of the founders of the Boston Parent Organizing Network. Susan now is an independent consultant who does training at the intersection of community building, education, and racial equity organizing. She is the author of The Education of a White Parent: Wrestling with Race and Opportunity in the Boston Public Schools (Levellers Press, 2012). Fascinating article! Thank you for this. I grew up in the suburbs of Boston in the 70s (Andover) and remember the busing controversy. I hadn’t known about this trend back into urban schools and really appreciate your looking at it from all sides. I’m currently on “sabbatical”, spending 8 weeks re-tracing the route some woman suffrage activists took 100 years ago. They were driving a petition to Congress and the President (from San Francisco to DC) demanding an amendment to the US Constitution enfranchising women. I’m trying to uncover more about their original trip and also trying to connect the dots forward to today, interviewing historians, academics, and activists and visiting museums, libraries and archives along the way. I’m blogging about it at http://www.suffrageroadtrip.com if you have the time/interest. Anyway, your article is a great reminder to me and to us all to include as many voices as possible in the discussion. This trip has been an eye opener to me how much of history has been preserved- and written- by the dominant culture, at a loss to us all. Women, Native Americans, African-Americans, Latinos, and other minorities end up as footnotes. Thanks, Anne. And good luck with your research.